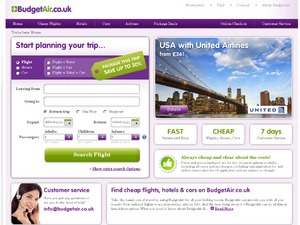 BudgetAir.co.uk – Compare & Find Cheap Flights, Hotels and Deals on Car hire and see the world for less. Book your travel with BudgetAir® today and Save! Limited Easter Sale: book a flight to your holidays now with a discount. Get £15 discount on all flights departing from the UK! Use voucher Code: EASTER15UK upon payment on the check-out page. The discount is valid on February 12-14th, 2019 (23:59 GMT+1). The discount is applicable on flights for any travel period. Do not miss another Budgetair UK voucher! Simply leave your e-mail address and we'll always keep you informed of new vouchers for Budgetair UK. It's the Saint Valentine's Day coming bringing love and discounts! Celebrate it with us - book your tickets now from the United Kingdom to any destination, for any travel period and get £15 off the price! Use the code LOVEUK18. The discount code is valid on February 13, 2018 from 0.00 until 23:59. £30 DISCOUNT on all destinations. Black Friday is finally here! This means that it's time for booking your next trip! Take advantage of a £30 discount on bookings from United Kingdom to anywhere in the world for any travel period. How? Just use the discount code: FRIYAY30 during the payment process. Discount code is valid from now until 23:59 on November 27th 2017. Happy (Black Friday) Booking! Discount for Summer Holiday! Get a £17 discount to your favourite holiday destination all summer long! We will help you book your SUMMER 2017 holiday. Not sure where to go? We've selected some amazing summer holiday deals to Asia, North America, South America, Africa and Oceania. The only thing you need to do: make sure to enter discount code SUMMER17* upon checkout. This summer discount is valid from June 21st to September 22nd, 2017. Don’t we all love a good sale? We do! To celebrate Black Friday and Cyber Monday, we present you: The Fabulous 4 Day Sale. On these 4 (fabulous) days, you can benefit from £15 discount on all flights worldwide. The only thing you have to do is enter voucher code: FABULOUSALE upon check out. Offer condition: You should not be paying full price today. Take advantage of a £15 discount on bookings from the United Kingdom to anywhere in the world. It's 24-Hour-Super-Sale! Take advantage of a £15 discount on bookings from United Kingdom to anywhere in the world, for any travel period. The only thing you need to to: Make sure to enter discount code FLYUK15 upon checkout. It's 24-Hour-Super-Sale! You should not be paying full price today. Take advantage of a £15 discount on bookings from United Kingdom to anywhere in the world, for any travel period. The only thing you need to do: Make sure to enter discount code 24HOUR15 upon checkout. The discount code is valid from now until 23:59 on June 7, 2016. Latest voucher code valid at a time of promo publication was entered to be working from 2019-02-11.